Fantasy: Shapes of Things Unknown ed. Edmund J. Farrell, Thomas E. Gage, John Pfordresher & Raymond J. Rodrigues (Scott, Foresman 0-673-03409-7, 1974, 384pp, tp); Textbook, in The Man [sic] in Literature Program [hello 1974]. This is my first textbook entry in the "Forgotten" Books roundelay, although some of my other choices over the last two and a half years have been used as texts in courses in various venues. Despite a certain potted quality about most of them, I've loved good literature anthology texts all my literate life, and collected them as I came across them for sale as a child, usually for small change in library and tag sales, and at the five-and-dimes such as WT Grant's (where the textbooks were usually in the 3/$1 bin rather than the 4/$1 bin with the Lancer paperbacks in the mid-'70s). Scott, Foresman was a leading publisher of elementary and high-school textbooks in the US in the 1970s, probably the leading publisher of the literature textbooks, and how many other books were so widely thrust upon public-school students, at least, yet so easily forgotten after they were turned back in at the end of the school year (leading to a brisk trade in queries to information librarians and occasionally booksellers, along the lines of "It was a story about a horrible car-crash, that turned out to be a test..." (I can identify this widely-reprinted story "spoiled" thus for you at the end of the entry...another widely-reprinted story in the same sort of venue was Donald Westlake's allegorical sf "The Winner," from Harry Harrison's Nova 1 anthology of original sf stories). Liberal and well-funded school districts might well've taken this and other volumes in the "Man in Literature Program" for junior or senior-high cirricula...I certainly would've enjoyed seeing what my classmates would make of the classroom discussion questions as this, for Hortense Calisher's "Heartburn": "Briefly summarize the circumstances by which Dr. Retz acquired the small animal in his chest. By what circumstances can he be relieved of it?" As it was, I first read Bradbury's "All Summer in a Day," Alan Nourse's "Brightside Crossing," and Clifford Simak's brilliant "Desertion" in my 7th-grade Scott, Foresman text, though the class only went through the Bradbury, after three previous years going through the Scott, Foresman "elite" series of Cavalcades, Ventures and Vistas in another state's elementary school...they also published the irregular set of hardcover editions of "free reading" books we had in the classroom, including Keith Robertson's Henry Reed's Journey and Harold Courlander's Ride with the Sun, which I have briefly reviewed previously. Meanwhile this is a fine selection of chestnuts and a few odd surprises, the umpteenth anthologization at least of such work as the Benson (whose Mapp and Lucia novels of manners would not yet have had their revival by 1974, and his brilliant horror fiction was still what he was best remembered for) and the Colliers and the Langelaan, with the Sturgeon, Du Maurier, Wellman and Gold not quite in the same league (each of those writers having more-anthologized stories) but all fine choices, and the Saki, Poe and Wellman impeccable choices except for the weak protest that these stories by them were almost ineluctable by any literate youngster. Well, persistent literate youngster. That kid probably wouldn't've had much other chance to read "Prey" or "Free Dirt," though, however much they might enjoy their creators' work on Twilight Zone repeats or horror or suspense film broadcasts...and the inclusion of such "outliers" as Harvey and the tall-tale retold among the other fantasies seems valuable to an old eclecticist such as myself. I'm sorry that reading texts these days probably aren't allowed to be as adventurous today (Texas's more retrograde folks do indeed lead the way), as I will enjoy acquainting myself with the few unfamilar stories in this volume, which arrived in today's mail, such as the Furnas and the apparently very obscure Conroy item, and rereading the plethora of familiar stories, almost all first read by the age I'd be assigned this book. 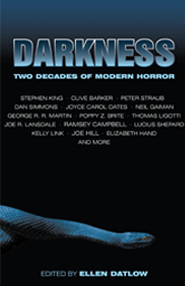 Darkness: Two Decades of Modern Horror, edited by Ellen Datlow and The Mammoth Book of the Best of the Best New Horror (the UK title differs slightly but is no more wieldy), edited by Stephen Jones. Both cover twenty-year periods, Datlow's the two decades after she was first on the jury for the World Fantasy Award and the next year co-edited the first of her Year's Best Fantasy and Horror volumes (my first published fiction, "Bedtime," she was kind enough to shortlist in the 1995 volume). Jones's book is more directly keyed to his annual Best New Horror, which he began, initially co-editing with Ramsey Campbell, with their 1990 volume...he takes one story from each volume so each of the twenty years is represented by a story; Datlow's book is less worried about having each year repressented, which is probably the richer if less systematic approach; John Pelan's enormous retrospective of 20th Century short horror fiction, forthcoming from Cemetery Dance Publications, is probably going to be not Quite the volume(s) it could be, in part because he is rigorously holding to a schedule of each year represented by one story and no writer having more than one story in the two volumes...the greatest error this forces, by me, is exclusion of Fritz Leiber's "Smoke Ghost," almost certainly the single most influential short horror story of the century in English...and some other questionable, if usually good, choices as Robert Bloch's representation by the relatively cheerful fantasy "That Hell-Bound Train" (his "Yours Truly, Jack the Ripper" is almost certainly the most plagiarized horror story published in English in the last century...though it wouldn't be my choice to represent him, either...perhaps "Sweets to the Sweet" among so many other candidates), or the inclusion of a number of what I'd call suspense stories, such as Joe Lansdale's triumphant "Night They Missed the Horror Show," rather than supernatural stories. 1923: George Allen England -- The Thing From--"Outside"
1984: Bob Leman -- The Unhappy Pilgrimage of Clifford M.
For more of this week's book selections, please see Patti Abbott's blog for the roundup of links and guest suggestions. "Test" by Thedore L. Thomas, from F&SF, April 1962, and reprinted at least twenty times, I'd guess. I recall seeing it in the Xerox Publications classroom magazine Read, for example, ca. 1977. Wow! There's plenty of great reading here! At one time, SF and FANTASY courses were popular on college campuses. That trend seems to be fading. There is, indeed, and as I noted in a discussion in the Horror list at Indiana U, I hope the Pelan, despite my disagreements with some of the premises and judgements, doesn't end up even more a sinmple collectors' item/forgotten book than it might be (the Peter Straub and other retrospectives have his name and larger publishers behind them)...though even David Hartwell's THE DARK DESCENT, which I have very strong criticisms of, is growing obscure as well. Part of the problem with the courses in college (and my FFB here is definitely a younger-readers text, with even the public school sign-in/sign-out roster in its inside front cover, careful to list both "county" and "parish" as a possible local political entity as the owners of the text) and not a few in the high schools is not only the graying of the audience for fiction, but more importantly I fear the notion that these courses could go to the seoond-raters and more callow junior faculty, or needn't be taken too seriously...certainly, in my own university career, it wasn't Robert Onopa nor A. A. Attanasio nor Ian MacMillan teaching the sf lit course at the University of Hawaii, but a relatively callow fellow (and the possessor of one of the most annoying speaking voices I've ever heard)...it was the only course I ever dropped at that campus (I was able to get into David Morrison's planetary astronomy course, which was a trade up I wouldn't've made in that semester if the first course looked at all promising); at George Mason University, where I finished my BA, the horror course was taught by a very competent professor who was taking a flier on a subject she was not confident about at all...I stuck with that one. In Shapes, two by Matheson? I'm surprised at that, perhaps they were cheap to obtain. Well, one was already a chestnut (his first publication, after all), the other a fairly recent publication at the time...and Matheson was at the zenith of his popularity at the time (at least so far! ), I'd say. ...and I think Matheson and Collier often speak particularly well to the young...suprising that Saki got only one entry. Whoa -- too much text! 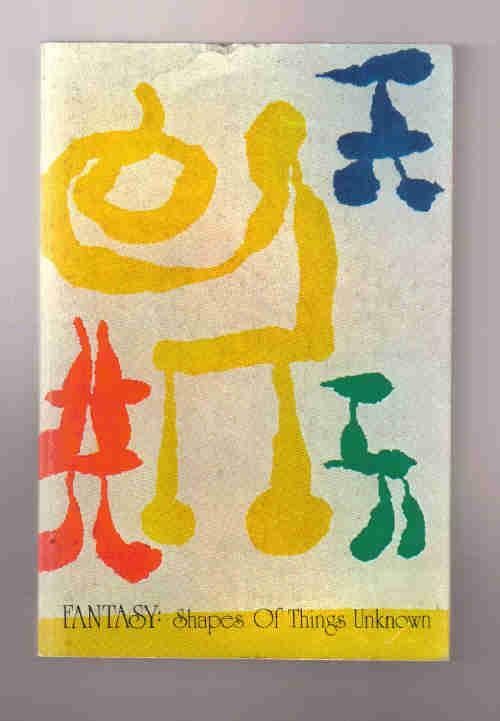 Eyes glazing over; but that Miro cover! Wow. I should figure out what book it was my sixth grade teacher used where we read Jacobs and lots of Poe and a few other things. Guess that would be early 70s...? Yeah, too tired when completing it to go get more illos. Probably could set the borrowed and/or upgraded indices off better, but work calls. And did he/she assign a text with the Poes and "The Monkey's Paw," or was it more along the lines that she/he read to you? Had quite a job finding my way to the end. I like anthologies too. My husband uses stories like this in his utopia/dystopia course but only in fragments. I wonder if anyone will publish the whole shebang except as an ebook soon. And yes Miro is worth the price alone. Fascinating stuff there, Todd. I would have loved to have a textbook like this at any point along the way. And the other anthologies listed look equally fun. Thanks for pointing it out. Well, like the Pelan antho, Patti, the JJ Adams dystopia anthology is forthcoming...the others I found in my whip-around a few months back all being out of print...and I really should've broken the consideration of the retrospectives off into another posting, away from the FFB...but weariness will out. I'm a fan of Miro from way back...had one of his items in repro from the Hirschorn up on my bedroom wall in Hawaii. Also, the Brubeck Quartet snagged a painting for my once clear-favorit album, and still one of my favorites, TIME FURTHER OUT: MIRO REFLECTIONS. Glad you liked it, Scott--the info density seems to be putting some off a little, and I can sympathize...that's often true of my prose at the best of times, but adding all the TOCs only reinforces matters. Yes, I do have to wonder how many schools ever picked up this particular Scott, Foresman series. I’m not sure why you don’t think the Lansdale shouldn’t be included in a book of horror stories. I find some of Lansdale’s short stories too unpleasantly strong for me to enjoy them, and “Night They Missed the Horror Show” would certainly fall into that category. It does seem to me at least as much a “horror story” as most of the supernatural entries. Two of the stories that I don’t know at all that sound particularly intriguing – “I Always Do What Teddy Says”, because I think that’s a great title and because it is, unusually for a science fiction story, from Ellery Queen and “Norman Wisdom and the Angel of Death”, because that’s an even better, and much weirder, title. Thanks, Steve--glad to be of service. I have an arguably reductionist view that if a story is horror, it must have supernatural or fantasy elements in it; if it's a "realistic" or other not actually fantasticated story, like the Lansdale, it's a suspense story, rather than a horror story. Thus, THE HAUNTING OF HILL HOUSE is a horror story (though could be read as suspense, albeit by stretching the point), while "The Lottery" is suspense fiction...PSYCHO is suspense fiction, while THE DEAD DON'T DIE is horror fiction (Bloch has rather few novels that are horror thus). And so on. And I'll agree with you that the Lansdale is pretty damned extreme (it has a subtitle or dedication, depending on how you look at it, that describes it as "a story that doesn't flinch"). There are certainly other, perhaps even more borderline cases, such as "The Yellow Wallpaper," or stories involving monstrous animals or sufficiently delusional human perception. But if consensus reality says it can happen, by me it's likely suspense, and if the threat/terror is completely metaphorical, it's horror. They have (at times only slightly) a different flavor. ELLERY QUEEN'S MYSTERY MAGAZINE and the other crime fiction magazines have usually been willing to run a fair bit of criminous sf, fantasy and horror over the years...certainly such amphibian writers as Edward Wellen, who also got an unfantasticated, but Very arguably near-future, terrorism novella into F&SF (I reviewed it as an FFB a while back), were likely to sell that kind of thing to the CF magazines. I haven't read it yet, though I tend to like Harrison's fiction (I'll check to see if it's in his 50-year retrospective volume). I'll hope to have read the Fowler pretty soon, too. It was a textbook or at least a reader, i.e. anthology with questions and activities at the end of each story I think. I could be wrong. Wrote my first round robin story in that class, then we made covers and bound them. Way cool. She also had her actor friend come in and perform "The Tell-Tale Heart" while we sat cross-legged on the floor in the darkness of candle-light. Great class: super teacher.